Buddy Hield and his Oklahoma teammates finally starting making shots after halftime. Hield scored all 19 of his points in the second half, when the 25th-ranked Sooners rallied with a big run in a 66-64 victory Saturday at No. 12 Baylor, which had won 13 straight at home. "I’m always a confident shooter, and my teammates are always encouraging me," said Hield, who was 7 of 11 in the second half after missing his three shots before then. "I got a little spurt going, but it’s all thanks to my teammates finding me in open spots, giving me that confidence to make shots." The Sooners (14-4, 3-2 Big 12) were down by eight right after halftime before reeling off 16 consecutive points, going ahead on a 3-pointer by Hield before Isaiah Cousins and Cameron Clark also hit from beyond the arc to cap that spurt. Baylor (13-4, 1-3) regained the lead on a putback by Cory Jefferson with just over 9 minutes left. The lead then changed hands three more times and the game was tied three times before Heild’s 3-pointer with 4 minutes that put the Sooners ahead 58-57. "I thought we did a better job of moving the ball in the second half," Sooners coach Lon Kruger said. "And of course, Buddy knocking down some 3s there, kind of jump-started everyone’s confidence, and that was great." Freshman guard Jordan Woodard made two free throws with 29 seconds left for a 65-58 lead. Baylor’s 7-foot-1 center Isaiah Austin then hit a 3-pointer from the top of the key before Woodard, a 78 percent free throw shooter, missed after being fouled with 18 seconds left. Austin hit another 3 from pretty much the same spot and Woodard had the ball again and was fouled. Woodard made the second of two free throws with 9.1 seconds left, leaving Baylor with one more chance. After point guard Kenny Chery brought the ball down the court and got it to Royce O’Neale whose pass toward Austin was deflected by Clark. O’Neale came away with the ball and turned for a shot, but it came after the buzzer and the basket that would have forced overtime didn’t count. "Nine seconds is a long time," Kruger said. "Seconds are precious at that point, and the deflection kind of used up just enough time for the horn to go off before they got control of it." Clark had 14 points, 10 after halftime, and Woodard added 10 points with eight assists for Oklahoma. Ryan Spangler, the Gonzaga transfer, had seven points and nine rebounds. Chery had 16 points and five assists for Baylor while Austin had 12 points and nine rebounds. Jefferson had 11 points and eight rebounds. Oklahoma got into the AP poll this week for the first time since November 2009, then promptly lost 72-66 at Kansas State while shooting a season-worst 33 percent. The Sooners were even worse than that in the first half Saturday, shooting only 23 percent (7 of 30), before getting on target with their big run and hitting 58 percent (15 of 26) shots after halftime. "In the first half we were tremendous defensively but we needed more separation at the beginning of the second half. 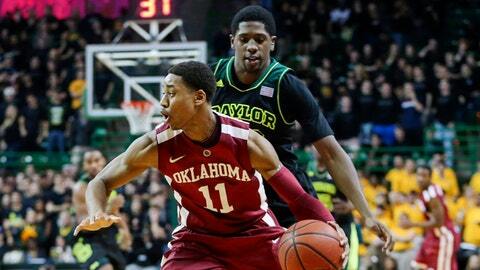 We didn’t come out with the same defensive intensity and they made shots," Baylor coach Scott Drew said. Chery knows where the blame goes for the letdown. "It’s on us as players," Chery said. "You can’t teach effort." Baylor is off to a rough Big 12 start after its only non-conference loss was to No. 2 Syracuse. The Bears next play at No. 15 Kansas on Monday night. The Bears were deliberate on their opening possession of the second half, making several passes before finally finding Jefferson inside for a basket that made it 32-24. They then went 5 minutes before Jefferson scored again. At one point, Drew ripped off his jacket in obvious anger with Austin down on the court after being elbowed in the face without a foul called. Drew even took two 30-second timeouts trying to slow down the Oklahoma run. Woodard had a steal from Chery, then had an assist on Hield’s layup that got the Sooners within 32-31 with 17:04 left. A minute later, Hield hit a 3-pointer to put the Sooners ahead for the first time since the game’s opening minutes. "I honestly don’t know what happened," Jefferson said. "We just didn’t come out ready (in the second half). Not like we did in the first half."